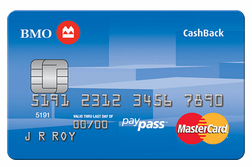 The sign up offers for BMO's CashBack cards changed yesterday. They have replaced the set dollar sign up bonus with increased earn on your spending in the first four months of having the cards. 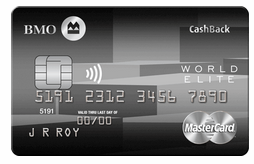 Both the World Elite and standard versions now offer 4% cash back on all eligible purchases for the first four months. There are caps to the maximum you can earn, $250 for the World Elite and $125 for the standard card. This means you'll want to spend at least $6,250 on the WE card or $3,125 on the standard card. If you are just out for the bonus and won't use the card past 4 months and don't need the insurance benefits, go for the standard card as it has no annual fee. If you count the annual fee into the bonus for the WE card you actually only come out with $130 which is only $5 more than the standard card. · Earn 1.75% CashBack on ALL card purchases* without restrictions*! Welcome Offer: Get 4% cash back on every purchase (up to $125 cash back) in your first 4 months*. · Earn 1% CashBack on ALL card purchases* without restrictions! *!